I graduated from Crocus Plains High School and started my university education at Queens and Carleton University. I operated a small business for years and benefited from numerous professional development courses in marketing and sales. I returned to university at BU in 2007 and am completing a 4 Year Bachelor of Arts, my major is Native Studies and my minor is Arts and Visual Culture. I am very proud of my family, I have a wonderful husband and five healthy children, these people are my rewards. My volunteer work includes hockey parent, BU Aboriginal Student Council, and the Aboriginal Literary Festival. I also enjoy working with students at the Indigenous Students’ Centre. I am originally from the Sioux Valley Dakota Nation and have lived in Brandon for many years. I come from a large family, all of whom are very supportive of me – along with my husband and children. I have previously been a business owner/ operator within the Brandon community; Native Images (1990-2005) was a gift shop that carried a wide variety of products but the main theme was Aboriginal arts, crafts, and giftware. My work allowed me to meet a wide range of people and it was very enjoyable. I also had a lot of flexibility which was helpful in raising a family. It was my involvement with Aboriginal arts and crafts along with the business of working with numerous people that sparked my interest in Arts and Visual Culture. My interest in Native Studies comes from a need to work for Aboriginal people and their communities. I believe that the values of love, respect, honesty, humility, truth, wisdom, and courage are values that everyone should strive to embrace. I see myself working to bring about a greater awareness of Aboriginal issues and sharing the benefits and knowledge that Aboriginal people have to offer. Ms. Whitecloud is a Native Studies major, currently completing a thesis on Indigenous Knowledge, who plans to attend the University of Manitoba’s graduate programme in Native Studies next year. 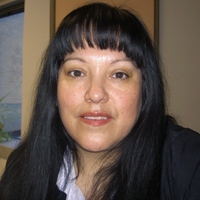 She is highly regarded by all of the Native Studies faculty, and has served as a marker for our Introduction to Native Studies course on several occasions. Her work in that capacity, as well as in all of her classes, has set a standard of excellence in our Department. She is unfailingly professional, reliable, and conscientious, and her work is consistently of the highest quality. Not only is her writing eloquent, intellectually persuasive and well-informed, it is also deeply committed, politically engaged scholarship of the finest sort – the kind that convinces as it persuades and compels. Indeed, in my view, she is already doing graduate level work. Lisa also serves as one of the two coordinators of the Indigenous Peoples Centre, and has helped to turn it into a welcoming space for many of us. She puts in many hours there, interacting extensively with our other indigenous students. It is my impression that she is widely-respected and admired by everyone. Certainly, she is a leader and a role model for First Nations women on this campus. She is also widely known and highly regarded by the Brandon community, as she was a business woman here for many years. I must say that she is an exceptional candidate for this honour, and that I recommend her for it with complete confidence and enthusiasm.